The idea of inflatable Jumping Pillows originated 25 years ago in Denmark. It is great fun and a healthy way of keeping kids entertained all day long.Jumping pillow are suitable for playgrounds, amusement parks, kindergartens, schools, sport clubs, etc.Of course, if your outdoor garden is big enough, you can also install it in the garden and let kids bounce around all day in the garden, which might also be a good choice. Typically, these exciting outdoor jumping pillows can hold about 20-30 people haveing fun on them.You can individually bounce without affecting people bouncing around you.The idea came from trampoline, but it's safer than trampoline! Because trampolines can be affected by other bouncers, but jumping pillows are not, this is a better way to get fit for kids. The jumping pillow’s a great workout, and it’s fun for every age! For jumping pillows, we also have specially designed for adults to provide an interesting jumping experience for adults.Covered with shade sails, you can't miss this colourful trampoline located right near the camp kitchen in the centre of the park. 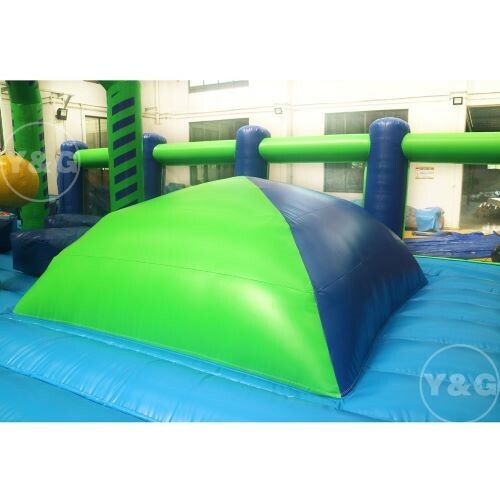 But the thing to notice is,jumping pillow cannot be used when wet, as it becomes very slippery. No sharp objects, shoes, skateboards or bikes permitted on the jumping pillow.Parents must be nearby to supervise when children play on the inflatable jumping pillow.